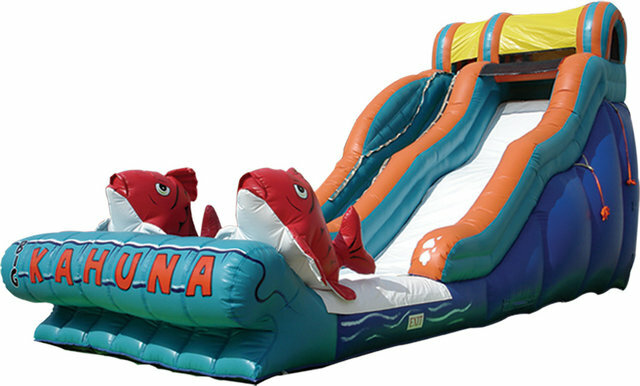 Our Big Kahuna water slide is perfect for little beach combers and surfers at your festival or party. A great way to cool off, this exciting ride allows participants to climb 19 feet to a No-Jump Top, which forces riders to slide down correctly, keeping them secure. A midway hump will have riders saying "Cowabunga!" into the safety-ended wet landing at the bottom of this impressive slide. A beachy, blue and orange ocean theme completes the Big Kahuna look, with a pair of orange fish waiting at the bottom of the slick and cool slide. The Big Kahuna slide is a great way to promote enjoyable and healthy activity, and will add excitement and value to any indoor or outdoor event!